It takes a special brand of player to go through three stages of qualifying, holding off a field of more than 870 players to earn a European PGA Tour card. 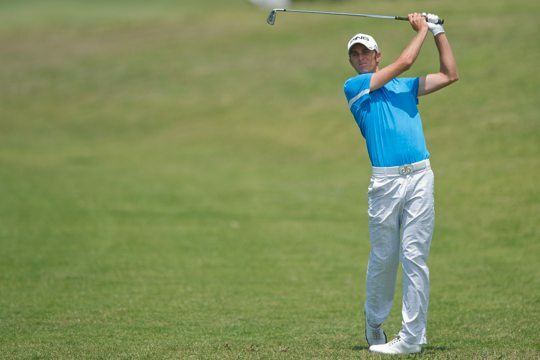 Yet former Sydney pennant player Scott Arnold has done the impossible, becoming one of just two Australian professionals to earn cards in Europe after a super-human effort at the PGA Catalunya Resort in northern Spain. Arnold was one of 28 players, including another Aussie Daniel Gaunt, who qualified for a crack at winning some of the big money in Europe in 2013. Arnold fired rounds of 67-73-67-72-73-71 to finish tied for 24th while Gaunt, a Victorian who excelled in the European Challenge Tour this year, fared even better, finishing in a tie for seventh after rounds of 74-68-68-69-69-70. The Qualifying School was taken out by Englishman John Parry, who secured his return to the European Tour in swashbuckling style by winning the Qualifying School Final Stage by four shots, thanks to a two-under-par 70 in the sixth and final round. Still Arnold’s effort to qualify was extraordinary as just four players managed to make it through all three stages of the Qualifying School to gain their cards. Alongside Arnold were impressive amateur Moritz Lampert as well as Peter Erofejeff and David Higgins. This gruelling event has brought plenty of drama over the years, and 2012 was no different, providing emotions at both ends of the scale. Young English pro Chris Lloyd saved his best until last with a five-under-par 67 to leap into the qualifying spots while Scotland’s Callum Macaulay also holed mighty putts on the 17th and 18th greens to finish on six-under-par, one shot inside the mark. Conversely another Scot, George Murray, was inconsolable after missing a short putt on the last, giving him a double bogey to miss his Tour card by one shot.